As expected, Android has been crowned as the world’s most popular operating system. The OS has surpassed Windows to get on the top. 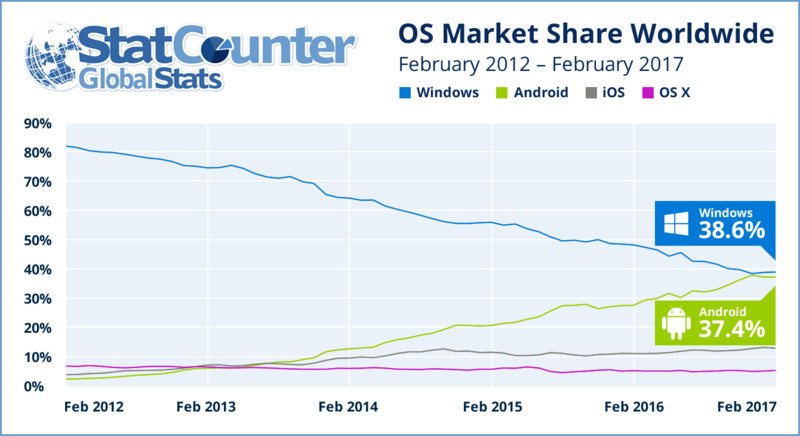 A report from StatCounter reveals that Android enjoys a user base of 37.93% winning over Windows’ 37.91%. The usage has been calculated across desktop, laptop, tablet and smartphone. Android reached the mark in March, but there are a few key points that are an exception to the numbers in the report. StatCounter has only taken internet-connected devices into account, which means that it has conveniently overlooked the devices that are used for particular purposes that don’t require internet connectivity. This is a milestone in technology history and the end of an era. It marks the end of Microsoft’s leadership worldwide of the OS market which it has held since the 1980s. It also represents a major breakthrough for Android which held just 2.4% of global internet usage share only five years ago. Besides, Windows still enjoys the top spot regarding PCs including desktops and laptops with 84% of a user base. Countering the user base stats of Windows in the PC segment, StatCounter says that it is no longer the pitch to measure the popularity of an OS. The stats also are highly dependent on the geographical spread. Windows has a share of 39.5% versus Android’s 25.7% in North America. In Europe, Windows hold 51.7% share against Android’s 29.2%. The major trend shift in the user base took place in Asia, wherein many users ditched desktops for smartphones. In Asia, Android is now over 50% (51.8%) compared to 29.8% for Windows. Windows won the desktop war, but the battlefield moved on. It will be difficult for Microsoft to make inroads in mobile, but the next paradigm shift might give it the opportunity to regain dominance. That could be in Augmented Reality, AI, Voice or Continuum (a product that aims to replace a desktop and smartphone with a single Microsoft-powered phone). Moreover, the report also says that Windows 10 surpassed Windows 7 for the first time in North America in December. Cullen also suggests that to contend against Android’s steady growth, Microsoft needs to maintain the momentum for Windows 10. These numbers don’t really surprise us as Android has been taking over the markets due to easy availability and wide spread of products. However, regarding PCs Microsoft still maintains its surge and shall excel in doing so for years to come.